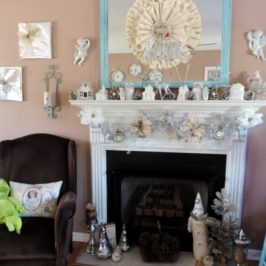 If you have a drab looking staircase and want to give it a little “pick me up” these easy staircase makeovers may give you some inspiration. 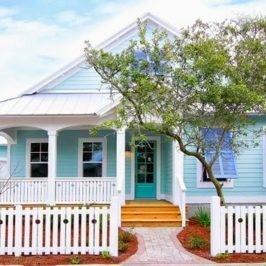 If your staircase is wooden and in pretty good shape you can give it a whole new look by simply painting each riser a different color like this one featured on Coastal Living Magazine’s Website. The bright colors just bring this staircase to life! Another easy way to dress up a simple staircase is to add wallpaper to each riser like this staircase makeover featured on Pretty Dandy’s Blog. I love how they used a different wallpaper on each riser. 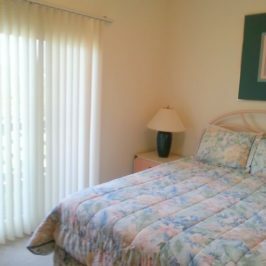 You could also get a similar look by decoupaging decorative paper or even fabric to each riser. Just be sure to seal it well with clear coat. 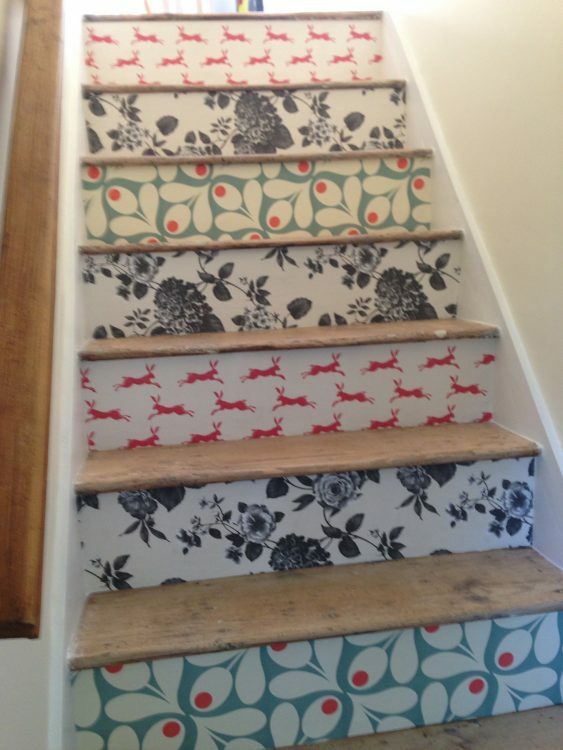 Stenciling is an easy creative option for giving your staircase some personality.I gave my staircase a makeover a couple of years ago with some paint and stenciling…. 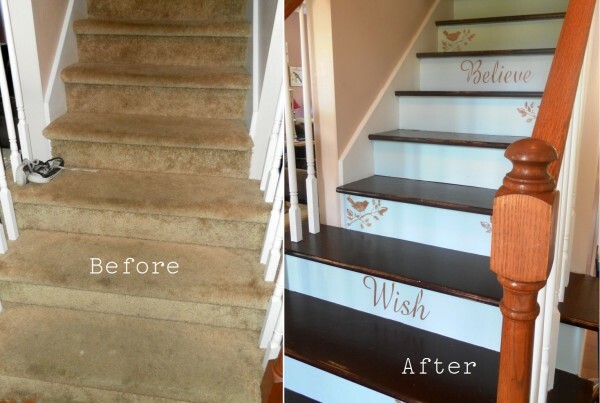 You can easily customize your own staircase with paint and read made stencils. If you have a carpeted staircase, giving it a makeover will be a bit more difficult. Removing the carpeting and prepping the stairs for paint requires a lot of elbow grease and sore muscles but in my opinion it was worth the time and effort! I love how my staircase turned out. What a difference! 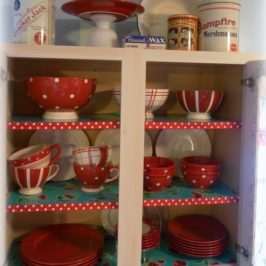 You can see this total transformation and get “How To” instructions in my blog post A Creative Staircase Makeover. 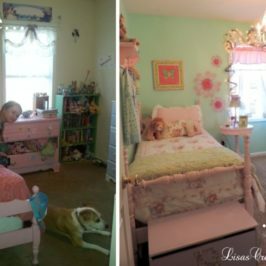 For more inspiration on easy staircase makeovers hop on over to Pinterest or Google Images. 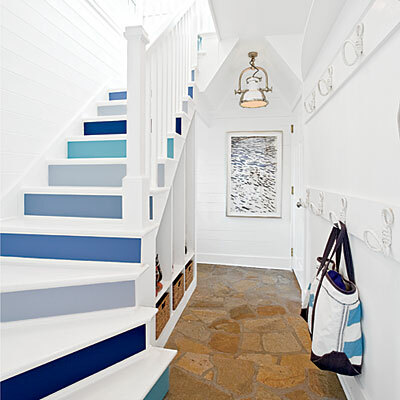 There are tons or creative folks giving new looks to their boring staircases. 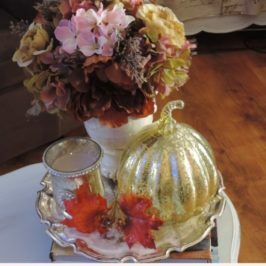 And that my friends, is another creative decorating tip just for you from Lisa’s Creative Designs!